This impressive 3 bedroom detached villa in Fethiye for sale has its own private plot with a spectacular Roman style private swimming pool. The villa has an open plan design aspect on the ground floor for the lounge, kitchen and dining area. There is a separate W/C and storage. Upstairs you will find 3 double bedrooms and a family bathroom. The villa in Fethiye for sale has uninterrupted views of the beautiful green valley of Ovacik and Ölüdeniz and will make an ideal setting to own a property in the sun. This villa also has great rental potential. 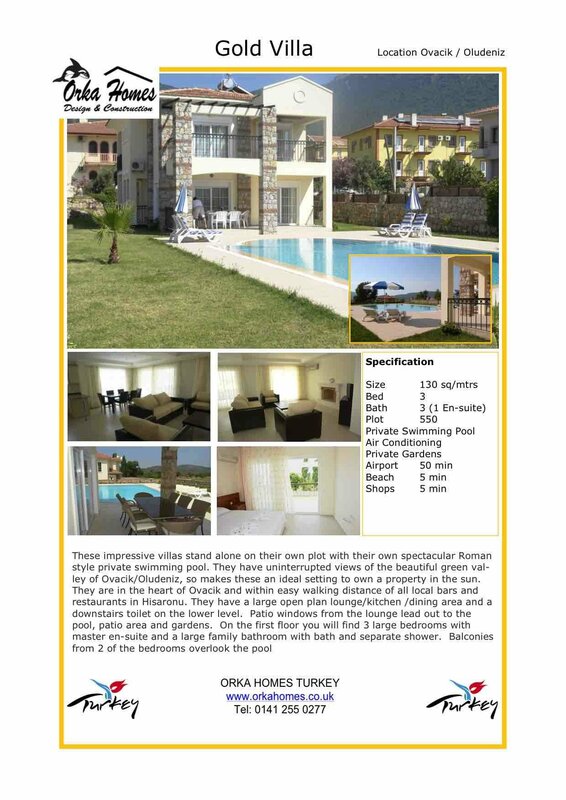 Orka Gold was chosen “Best House Turkey” by Homes Overseas magazine.